Transform your space with stunning features of Titanium Ceramic by enhancing the appearance of your kitchen backsplashes, bathroom walls and floor, or accent feature walls. The Titanium Ceramic Collection enhances the aesthetic appeal of a variety of environments and imaginations. Product is warranted to be free from defects at the time of purchase. The Merola Tile Galaxy Flower Black 4-1/4-inch x 12-3/4-inch x 9 mm Porcelain Border Mosaic Tile captures the classic penny round tile and matches it with a decorative flower, making an eye-catching combination of shapes and sizes. Great for indoor or outdoor applications, this tile is impervious, frost and skid resistant to suit your needs. This beautiful Border Tile features a smooth glazed, medium sheen finish and a mixture of glossy and matte black designs to help add style to your decor. An ideal choice for any space, this porcelain tile is designed for light duty residential floors and walls. See the rest of our Galaxy and Comet Penny Rounds for coordinating floor and wall tiles. The Merola Tile Meta Penny Round 11-3/4-inch x 11-3/4-inch x 8 mm Stainless Steel Over Ceramic Mosaic Tile adds sleek, contemporary style and charisma to almost any space. Each individual circular tile is approximately 3/4 in. and features a high-sheen, brushed-metal finish. Use non-sanded grout and plastic tools (sold separately) during installation to help prevent the tile from scratching. This tile is designed for indoor wall use, perfect for a modern kitchen backsplash or strip accent with glass mosaic tiles. 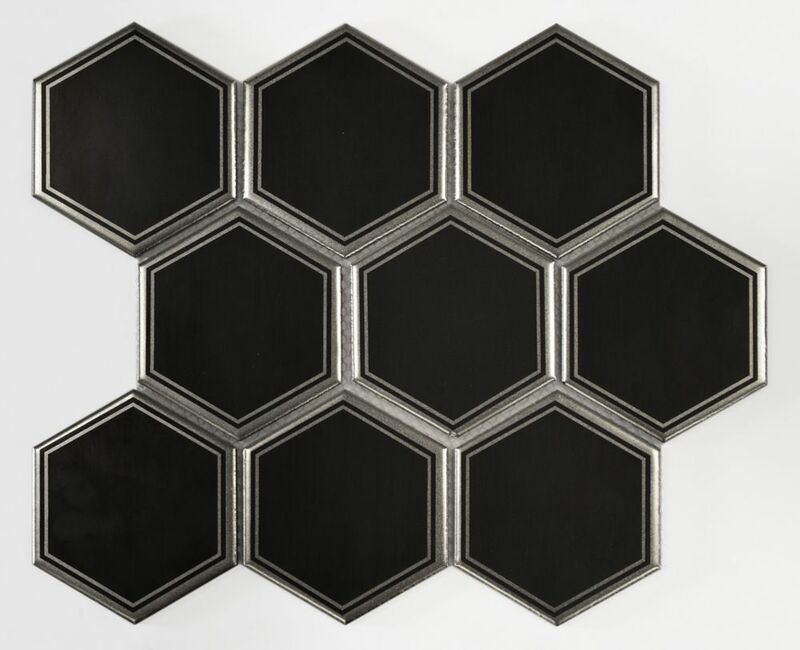 4-inch x 4-inch Hexagon Titanium Black Ceramic Matte Mosaic Transform your space with stunning features of Titanium Ceramic by enhancing the appearance of your kitchen backsplashes, bathroom walls and floor, or accent feature walls. The Titanium Ceramic Collection enhances the aesthetic appeal of a variety of environments and imaginations.